In 1998, as a senior environmental economics major at the University of Utah, Ian Brandt started a vegetarian food cart. Brandt originally intended to pursue a career in the Utah’s ski industry, but soon discovered that said it didn’t jive with his philosophy. “[I] saw so many flaws in that industry and how it attended to the needs of the environment,” Brandt says, “So I started trying to generate some ideas as to what I would do to find work.” And thus the vegetarian food cart was born. For about a year Brandt could be found at the Farmer’s Market, the Downtown Concert Series and outside of certain shows held at the Zephyr, serving up vegetarian burritos. 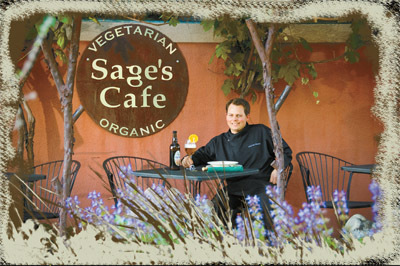 In December of 1999 he opened Sage’s Café (named after his one-year-old son) a restaurant dedicated to serving organic and vegetarian food. Now Brandt is the executive chef for two pure vegetarian restaurants–– Sage’s and Vertical Diner. Both restaurants serve pure vegetarian food, without the use of a microwave, and using the largest amount of organic products as possible. “Sage’s Café has more vegetableoriented preparations where Vertical is more starch-oriented. Sage’s Café is approximately 80 percent organic. Vertical is approximately 40 percent organic,” Brandt states when noting differences between the two restaurants. Even though the menu at Sage’s continuously features new items (as opposed to Vertical, which has a set menu) each restaurant has become well-known for specific dishes. The shitake escargot, carrot butter pate and vegan tiramisu are some of the favorites at Sage’s, while American-diner style dishes like the tender tiger (faux chicken nuggets), hand-cut fries and jerk-chicken burrito reign supreme at Vertical. Brandt is also the owner of Cali’s Natural Foods (named after his daughter Calista) the warehouse that has provided the bulk of ingredients for both restaurants for the past nine months. While many restaurants rely on companies like Sysco, U.S. Food Services and Nicholas to provide food products, Brandt has been able to almost totally eliminate any of these major food suppliers from the equation. “At Cali’s we produce our own house brand recipes. We put the quality ingredients into them and we make them. The only thing we buy from Nicholas right now is the Cholula,” Brandt says. Cali’s warehouse has allowed Brandt to buy more products in bulk for both restaurants, which will save thousands of dollars in the long run. “By saving that money we can keep our quality standards to where they are and try to keep the prices down…especially in this bad economy that we have now,” Brandt says. And this August Cali’s Natural Foods will open its doors to the public. “[I wanted] to provide a better price than Whole Foods and provide a little more flare than Costco,” Brandt says of his decision to open Cali’s to the public. The warehouse is located right next door to Costco, on 389 W and 1700 S. Brandt plans to sell everything by the pound and by the case. “It would be an alternative to going to Costco, with similar pricing, but you won’t have to support the shareholders that own the company,” he says. In a nutshell, Cali’s will be an independent hybrid of Whole Foods and Costco––a grocery store that will respond to the needs of its consumers and support other local businesses. A large portion of the goods sold at Cali’s will be vegetarian, organic and fair trade. Another main focus will be an attempt to reduce the footprint created by transporting food items across the country. Brandt plans to buy as many local and regionally grown crops as possible to stock Cali’s. Instead of buying macadamia nuts from Hawaii he plans to purchase them from California as just one more way to reduce his negative enironmental impact on the world. Although Brandt has many big plans for Cali’s, he’s realistic and knows that many baby steps will have to be taken before Cali’s becomes the utopian store of his dreams. “My hope is that people don’t get upset that they can’t get everything that they need there [immediately],” Brandt says. The specific opening date of Cali’s is yet to be determined, but Brandt says it’s likely to happen sometime in August. Until then swing by Vertical (2280 S West Temple) or Sage’s (473 E 300 S) to get your fill of delicious organic and animal-free food.